The Edgar County Court House in Paris, IL is a beautiful example of the Romanesque Revival style. Designed by architect Henry Eliot, this historic building was constructed between 1891 and 1893. One of the most notable and important features of the court house is its “Lady Justice” statue, which sits atop the copper-clad tower and dome, 150 feet into the sky. Unfortunately, the zinc sheet metal statue was severely deteriorated, and was in need of major repairs before it could be returned to its rightful place atop the Edgar County Court House. 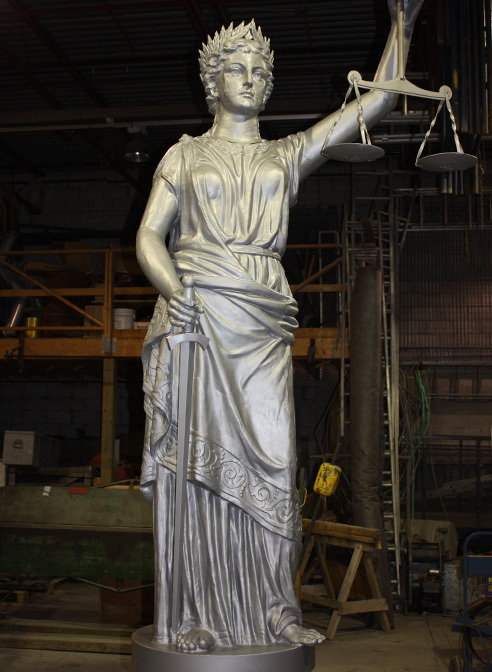 Working in conjunction with Midwest Maintenance of Piqua, Ohio Heather & Little were commissioned to restore the Lady Justice statue as part of a major restoration project on the Edgar County Courthouse. Before work could begin however, the statue had to be carefully removed from atop the dome, high above the court house. 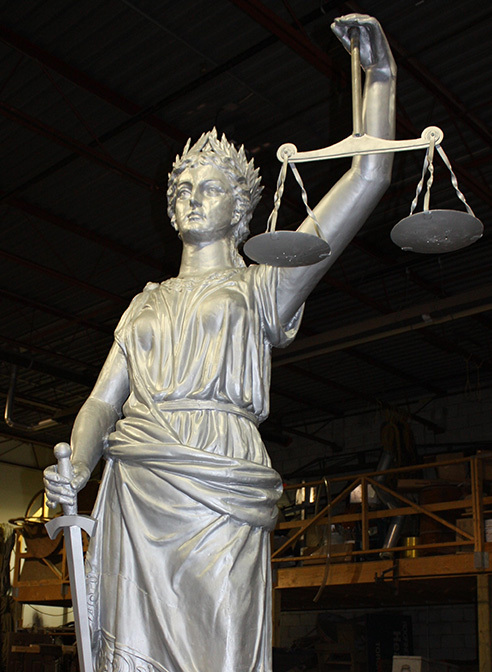 After being lowered, the Lady of Justice statue was transported to Heather & Little’s shop where the restoration could be performed. The old sheet metal statue was fabricated in sheet zinc with many areas badly deteriorated and a new steel support mast had to be incorporated before carefully crating, and returning her home to Paris, Illinois. 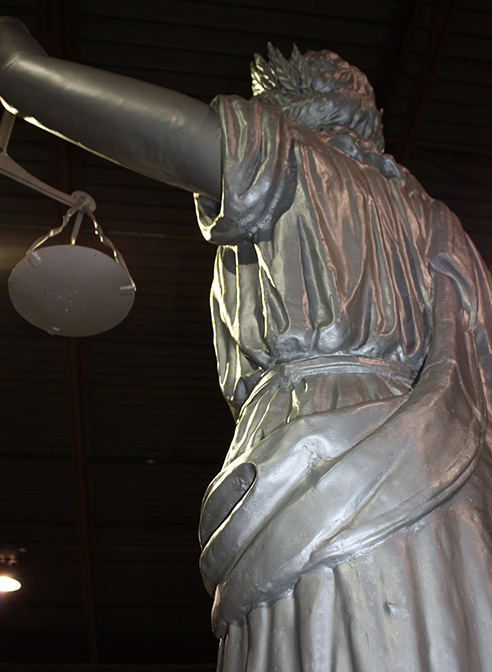 Our skilled artisans reproduced all missing and damaged parts of this historically significant statue, including the creation of new justice scales, hands and the entire upright arm that holds the scale. To find out more about this statue repair and restoration project, browse the photos below. 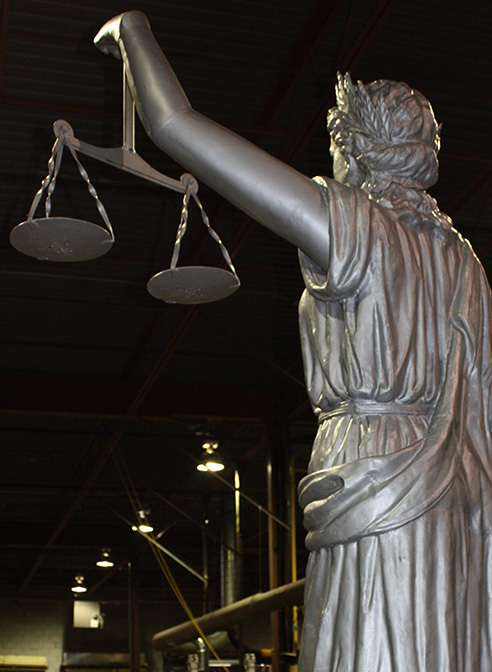 Have a question about our sheet metal statue restoration services? Contact Heather & Little today!